Cabbage is an ingredient widely used in Eastern and Northern Europe. 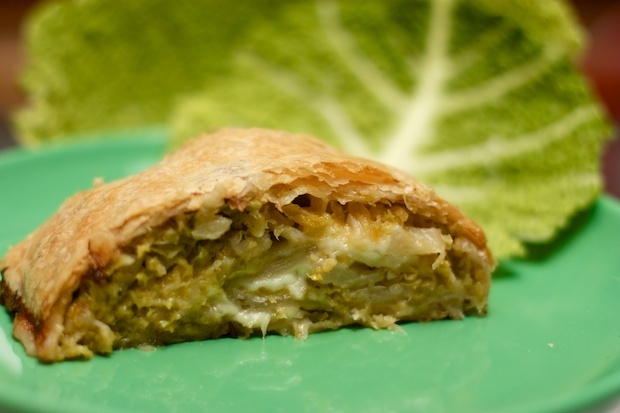 If you happen to go to Croatia or Slovenia in the winter, you will find it as an accompaniment to pork served as a cabbage strudel. Whenever I tried this dish I felt the desire to learn the recipe, but so far I have not been lucky. So I decided to test a possible implementation going on memory alone of the dish’s flavors. The dish was pleasant and versatile, it can be presented either as a starter or as a unique plate when you want to have a light meal. Clean the cabbage and remove the core and outer leaves, cut into strips and rinse it under running water. Meanwhile, in a large pan add the oil, garlic, onion that has been cut into thin slices and sage leaves. Sauté everything for a few minutes then add the cabbage, a glass of water, salt and pepper. Stir often, after about 20 minutes of cooking should be soft and the liquid should have evaporated, add the caraway seeds and turn off the burner. Open the package of puff pastry and roll out the dough on a sheet of baking paper. Distribute the cabbage evenly over the dough, making sure to leave about two inches of free around the boarder. Place the cheese that has been cut into strips over the cabbage. With the help of the same parchment paper that wraps the dough, roll the dough forming the strudel. Place the strudel on a baking dish and bake for 45 minutes. Serve hot sliced ​​thicker or thinner if it is a starter.